Chicken meat is the most common form of poultry in the world. Nearly all parts of the bird can be used for food and it can be cooked in different ways. Whole chicken refers to the uncut "dressed" chicken. This means the feathers, feet, head, and internal organs have been removed. Smaller chickens are called Broilers (1-3 pounds and 4-6 weeks of age), slightly bigger are Fryers (3 1/2 - 4 1/2 pounds and 6-10 weeks of age), the next largest chicken is the Stewing Hen, or Fowl, (6-8 pounds and over 10 months of age), and finally the Roasters (7-9 pounds and 3-5 months of age). Buying: Buy your chicken from a vendor you trust. Support local farms. 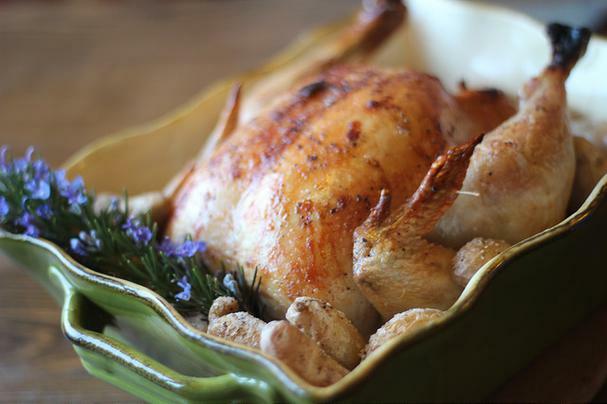 Cleaning: Raw chicken should be rinsed, patted dry with paper towels, and completely thawed before cooking. Cutting boards and knives must be washed in hot sudsy water before and after using, and hands must be scrubbed thoroughly before and after handling.